The Ahwazi Arabs are one of the largest minority groups living in Iran and are predominantly settled in the Al‐Ahwaz province. Al‐Ahwaz, also known as Arabistan or Khuzestan, is situated in the south-western part of Iran. It borders the Basra province, Iraq in the west, the Gulf, the Shat al‐Arab waterway and the mountains of Lurestan and Kurdistan in the north and east respectively. Its capital is the city of Ahwaz. 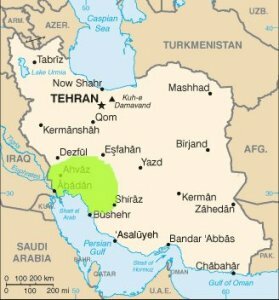 Nearly 85% of Iran’s oil originates from Al‐Ahwaz, due to its location at the tip of the Gulf and the Shat al‐Arab waterway. The Karoun River, Iran’s largest, flows through Al‐Ahwaz into the Gulf and constituted a major means of transportation through the region before the drying out the river as well as the excessive dam construction (around 89 dams were built in the area). The Al‐Ahwaz province is one of the most lucrative provinces because of its natural resources and shipping ability. In spite of this wealth, Ahwazis living in Al‐Ahwaz only benefit from a small part of the profits and many are forced to relocate due to the Iranian oil industry, large State-funded development projects and dam constructions. Apart from not being compensated for the loss of their lands, the Ahwazi Arabs suffer constantly under widespread abuse and discrimination by the Iranian government. Since the 1980s the Iranian government has imposed several discriminatory ethnic and religious policies that have prevented Ahwazi Arabs from participating in government, limited their access to education and resources and also drove them into abject poverty. In order to silence opposition, Iranian authorities try to intimidate the Ahwazi Arabs by using all kinds of violence such as arbitrary arrests, torture, deportation and the destruction of property. The United Nations (UN) institutions, the European Union (EU) and many State governments have condemned Iran’s repressive and discriminatory policies towards religious and ethnic minorities including Ahwazis on various occasions but the situation of Ahwazis remains worrying. The Democratic Solidarity Party of Ahwaz (DSPA) aims to create a socially and politically dynamic civil society promoting the rights of the Ahwazis as a national minority in Iran. The DSPA does not dispute the territorial integrity of Iran but rather believes that Iran is a multi‐national, multi‐lingual and multi‐cultural State. It aspires to a peaceful change of the current system of governance and the establishment of a secular, federal democratic republic in which all minorities would be represented and given a voice. The DSPA is a member and one the founders of the Congress of Nationalities for a Federal Iran (CNFI), an organisation of 16 regional and ethnic minorities in Iran peacefully campaigning for the autonomy of Iran’s regions within a democratic federal system. Although the region inhabited by the Ahwazi is rich in natural resources and produces up to 95% of Iran's oil and gas, the disproportion of wealth and the social inequality existing between Arabs and the ethnic majority Persians is clear, as the formers live in abject poverty. Discrimination policies towards the minorities and indigenous groups as well as Persianisation through legal means in the Khuzestan province leads to high unemployment rate in the region, and over 70% of the employees in the region are non-locals. Besides the severe socio-economic deprivation, the indigenous Arab people suffer from one of the highest rates of poverty in Iran, as well as high levels of water and air pollution due to oil exploitation. Furthermore, as part of the Persianisation of the region, in the last 15 years, the Iranian government has confiscated land from indigenous farmers to resettle other ethnic groups and to establish development projects. Aggressive Persian nationalism also excludes Arabs and all other nationalities from educational systems and media, reflected in the ban of non-Persian languages, literature and cultures. Tehran denies the rich character of a multinational, multilingual and multicultural Iran by means of Persianisation policies. Additionally, like other human rights activists in Iran, those who campaign for the Ahwazis face constant oppression from the government, including arbitrary arrests and impresonment, torture and ill-treatment. Suspeciously regarded by the government, their demands for basic fundamental rights are also often labeled as secessionists and ignored by the authorities. Moreover, under the government of President hassan Rouhani Iran has hardly met obligations to respect human rights. On the contrary, as part of a strategy to silence human rights activists, Iran's judicial and security bodies have waged a vicious crackdown against ethnic minorities by conducting enforced disappearances. Please download our Ahwazi Member Brochure to learn more.